These highlights do not include all the information needed to use TENIVAC safely and effectively. See full prescribing information for TENIVAC. TENIVAC® is a vaccine indicated for active immunization for the prevention of tetanus and diphtheria in persons 7 years of age and older. In persons who have not been immunized previously against tetanus and diphtheria, primary immunization with TENIVAC vaccine consists of three 0.5 mL doses. The first 2 doses are administered 2 months apart and the third dose is administered 6-8 months after the second dose. 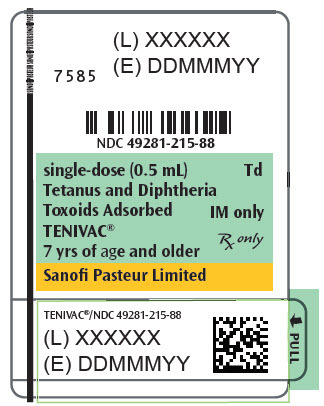 TENIVAC vaccine may be used to complete the primary immunization series for tetanus and diphtheria, following one or two doses of Diphtheria and Tetanus Toxoids and Pertussis Vaccine Adsorbed (whole-cell DTP), Diphtheria and Tetanus Toxoids and Acellular Pertussis Vaccine Adsorbed (DTaP), and/or Diphtheria and Tetanus Toxoids Adsorbed (DT). However, the safety and efficacy of TENIVAC vaccine in such regimens have not been evaluated. TENIVAC vaccine may be used for routine booster immunization against tetanus and diphtheria in persons 7 years of age and older. Routine booster immunization against tetanus and diphtheria is recommended in children 11-12 years of age and every 10 years thereafter. For active tetanus immunization in wound management of patients 7 years of age and older, a preparation containing tetanus and diphtheria toxoids is preferred instead of single-antigen tetanus toxoid to enhance diphtheria protection. (1) TENIVAC vaccine is approved for wound management of patients 7 years of age and older. • Such as, but not limited to, wounds contaminated with dirt, puncture wounds and traumatic wounds. 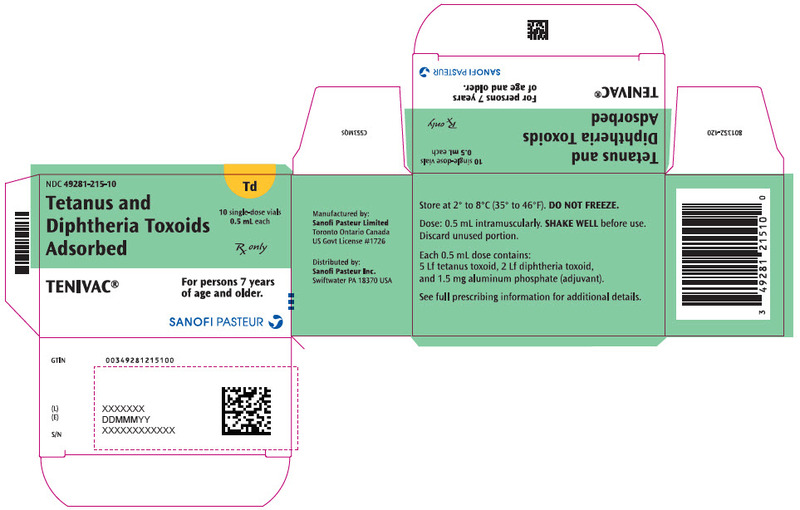 • If only three doses of fluid tetanus toxoid have been received, then a fourth dose of toxoid, preferably an adsorbed toxoid should be given. • Yes, if >10 years since last dose. Just before use, shake the vial or syringe well until a uniform, white, cloudy suspension results. Parenteral drug products should be inspected visually for particulate matter and discoloration prior to administration, whenever solution and container permit. If these conditions exist, the product should not be administered. When withdrawing a dose from a rubber-stoppered vial, do not remove either the rubber stopper or the metal seal holding it in place. Each 0.5 mL dose of TENIVAC vaccine is to be administered intramuscularly. The preferred site is the deltoid muscle. The vaccine should not be injected into the gluteal area or areas where there may be a major nerve trunk. TENIVAC vaccine should not be combined through reconstitution or mixed with any other vaccine. A severe allergic reaction (e.g., anaphylaxis) after a previous dose of TENIVAC vaccine or any other tetanus toxoid or diphtheria toxoid-containing vaccine or any other component of this vaccine is a contraindication to administration of TENIVAC vaccine. [See Description (11).] Because of uncertainty as to which component of the vaccine may be responsible, none of the components should be administered. Alternatively, such individuals may be referred to an allergist for evaluation if further immunizations are to be considered. Epinephrine hydrochloride solution (1:1,000) and other appropriate agents and equipment must be available for immediate use in case an anaphylactic or acute hypersensitivity reaction occurs. The tip caps of the TENIVAC prefilled syringes may contain natural rubber latex, which may cause allergic reactions in latex sensitive individuals. Persons who experienced an Arthus-type hypersensitivity reaction following a prior dose of a tetanus toxoid-containing vaccine usually have high serum tetanus antitoxin levels and should not receive TENIVAC vaccine more frequently than every 10 years, even for tetanus prophylaxis as part of wound management. A review by the Institute of Medicine found evidence for a causal relation between tetanus toxoid and both brachial neuritis and Guillian-Barré syndrome. (2) If Guillain-Barré syndrome occurred within 6 weeks of receipt of prior vaccine containing tetanus toxoid, the decision to give TENIVAC vaccine or any vaccine containing tetanus toxoid should be based on careful consideration of the potential benefits and possible risks. Vaccination with TENIVAC vaccine may not protect all individuals. In a primary immunization study conducted in Canada, 18 participants, 8 of whom were 6 to 9 years of age and 10 of whom were 17 to 56 years of age, received three doses of TENIVAC vaccine. In four booster immunization studies conducted in either the US or Canada, TENIVAC vaccine was administered to 3,723 participants overall, ranging in age from 11 to 93 years. In one of these studies, a US multi-center booster immunization study (TDC01), 2,250 adolescents and adults ages 11-59 years of age received TENIVAC vaccine in an open-label design and adults 60 years of age and over were randomized to receive either TENIVAC vaccine (N = 700) or DECAVAC vaccine (US licensed Td manufactured by Sanofi Pasteur Inc.) (N = 701). Vaccine assignment for participants â‰¥60 years of age was unblinded to pharmacists and vaccination nurses, but was blinded to other study personnel and participants. Among participants who received TENIVAC vaccine, overall, 80.4% were Caucasian, 3.3% Black, 5.1% Hispanic, 4.5% Asian and 6.6% other races. Among participants â‰¥60 years of age, the racial distribution was similar for the TENIVAC vaccine and DECAVAC vaccine groups. Among participants who received TENIVAC vaccine, the proportion of participants who were female varied by age group (44.4% of participants 11-18 years of age, 70.1% of participants 19-59 years of age and 62.4% of participants â‰¥60 years of age). Among participants â‰¥60 years of age who received DECAVAC vaccine, 57.6% were female. Nearly all (99.8%) enrolled participants and all participants in the per-protocol immunogenicity population had a reported or documented history of previous immunization against tetanus and diphtheria and, by report, had not received a vaccine containing tetanus or diphtheria toxoid within 5 years prior to enrollment. In the US multi-center booster immunization study, solicited injection site reactions and systemic adverse events were monitored on diary cards for a subset of participants 11-59 years of age and for all participants â‰¥60 years of age. The incidence and severity of solicited injection site reactions and selected solicited systemic adverse events that occurred within 3 days following vaccination are shown in Table 2. • Moderate: interfered with activities, but did not require medical care or absenteeism. • Severe: incapacitating, unable to perform usual activities, may have/or required medical care or absenteeism. In the US booster immunization study, among participants â‰¥60 years of age, 7 (1.0%) participants in the TENIVAC vaccine group and 10 (1.4%) participants in the DECAVAC vaccine group experienced a serious adverse event within 30 days following vaccination. During this period, 2 (0.3%) participants 19-59 years of age and no participants 11-18 years of age experienced a serious adverse event following TENIVAC vaccine. Serious adverse events within 30 days following TENIVAC vaccine included localized infection, asthma, colonic polyp, cellulitis, angina pectoris, hip and wrist fracture, cholecystitis, chest pain and cerebrovascular accident. There were five deaths reported during the study. All of the reported deaths were in participants â‰¥60 years of age and occurred >30 days post-vaccination: three in the TENIVAC vaccine group (cardiopulmonary arrest; myocardial infarction and septic shock; and unknown cause) and two in the DECAVAC vaccine group (myocardial infarction and congestive heart failure; and liver cancer). In the primary immunization study (N = 18) in which serious adverse events were monitored for 3 days following each vaccination and in three other booster immunization studies in which serious adverse events were monitored for either four days (N = 347) or one month (N = 426) following vaccination, no serious adverse events were reported. The following adverse events have been spontaneously reported during the post-marketing use of TENIVAC vaccine. Because these events are reported voluntarily from a population of uncertain size, it is not always possible to reliably estimate their frequency or establish a causal relationship to vaccine exposure. anaphylactic reaction (bronchospasm and angioedema). No safety and immunogenicity data are available on the concomitant administration of TENIVAC vaccine with other US licensed vaccines. Animal reproduction studies have not been conducted with TENIVAC vaccine. It is also not known whether TENIVAC vaccine can cause fetal harm when administered to a pregnant woman or can affect reproduction capacity. TENIVAC vaccine should be given to a pregnant woman only if clearly needed. Animal fertility studies have not been conducted with TENIVAC vaccine. The effect of TENIVAC vaccine on embryo-fetal and pre-weaning development was evaluated in one developmental toxicity study using pregnant rabbits. Animals were administered TENIVAC vaccine twice prior to gestation, during the period of organogenesis (gestation day 6) and later during pregnancy on gestation day 29, 0.5 mL/rabbit/occasion (a 17-fold increase compared to the human dose of TENIVAC vaccine on a body weight basis), by intramuscular injection. No adverse effects on pregnancy, parturition, lactation, embryo-fetal or pre-weaning development were observed. There were no vaccine related fetal malformations or other evidence of teratogenesis noted in this study. It is not known whether TENIVAC vaccine is excreted in human milk. Because many drugs are excreted in human milk, caution should be exercised when TENIVAC vaccine is administered to a nursing woman. TENIVAC vaccine is not approved for use in infants and children younger than 7 years of age. Safety and effectiveness of TENIVAC vaccine in this age group have not been established. 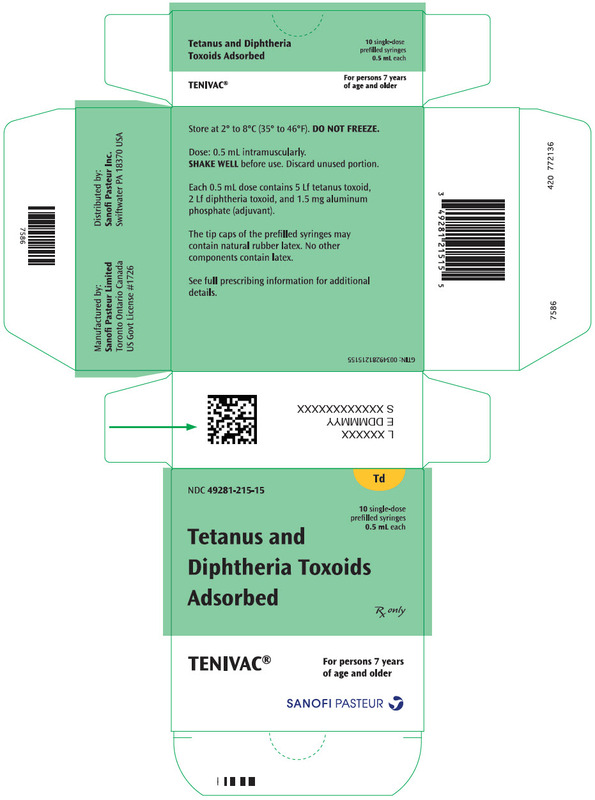 TENIVAC vaccine, Tetanus and Diphtheria Toxoids Adsorbed, is a sterile isotonic suspension of tetanus and diphtheria toxoids adsorbed on aluminum phosphate. Other ingredients per 0.5 mL dose include 1.5 mg of aluminum phosphate (0.33 mg of aluminum) as the adjuvant and â‰¤5.0 mcg of residual formaldehyde. Clostridium tetani is grown in modified Mueller-Miller casamino acid medium without beef heart infusion. (3) Tetanus toxin is detoxified with formaldehyde and purified by ammonium sulfate fractionation and diafiltration. Corynebacterium diphtheriae is grown in modified Mueller's growth medium. (4) After purification by ammonium sulfate fractionation, diphtheria toxin is detoxified with formaldehyde and diafiltered. Tetanus and diphtheria toxoids are individually adsorbed onto aluminum phosphate. The adsorbed tetanus and diphtheria toxoids are combined with aluminum phosphate (as adjuvant), sodium chloride and water for injection. This product contains no preservative. In the guinea pig potency test, the tetanus toxoid component induces at least 2 neutralizing units/mL of serum and the diphtheria toxoid component induces at least 0.5 neutralizing units/mL of serum. The tip caps of the prefilled syringes may contain natural rubber latex. The vial stoppers do not contain latex. Tetanus is an acute disease caused by an extremely potent neurotoxin produced by C tetani. Protection against disease is due to the development of neutralizing antibodies to tetanus toxin. A serum tetanus antitoxin level of at least 0.01 IU/mL, measured by neutralization assay is considered the minimum protective level. (5) (6) A tetanus antitoxoid level of â‰¥0.1 IU/mL as measured by the ELISA used in some clinical studies of TENIVAC vaccine is considered protective. TENIVAC vaccine has not been evaluated for carcinogenic or mutagenic potential or impairment of fertility. A three-dose primary immunization series with TENIVAC vaccine was evaluated in 17 participants ages 6 to 56 years in a study conducted in Canada. [See Adverse Reactions (6.1).] The first two doses were administered two months apart, followed by a third dose six to eight months after the second dose. Serum tetanus antitoxin levels were measured by an in vivo neutralizing assay and serum diphtheria antitoxin levels were measured by an in vitro neutralizing assay. [See Clinical Pharmacology (12.1).] All 17 participants had serum tetanus and diphtheria antitoxin levels pre-vaccination and 7 days post-vaccination <0.01 IU/mL, consistent with no previous immunization. Four weeks following the second dose, all 17 participants had a serum tetanus antitoxin level >0.1 IU/mL and a serum diphtheria antitoxin level â‰¥0.01 IU/mL. Four weeks following the third dose, all 17 participants had a serum diphtheria antitoxin level >0.1 IU/mL. In the US multicenter booster immunization study (TDC01) [see Adverse Reactions (6.1)], the immune response to a dose of TENIVAC vaccine was evaluated in an open-label manner in a subset of participants 11 to 59 years of age, and in comparison to DECAVAC vaccine in participants â‰¥60 years of age who were randomized to receive a dose of either TENIVAC vaccine or DECAVAC vaccine. Tetanus immune responses, measured by ELISA [see Clinical Pharmacology (12.1)] are presented in Table 3. Diphtheria immune responses, measured by a microneutralization assay [see Clinical Pharmacology (12.1)], are presented in Table 4. Among adults 65 years of age and over who received TENIVAC vaccine (N = 419), 94.5% (95% confidence interval 91.9, 96.5) had a post-vaccination tetanus antitoxoid level â‰¥0.1 IU/mL and 61.1% (95% confidence interval 56.2, 65.8) had a post-vaccination diphtheria antitoxoid level â‰¥0.1 IU/mL. Post- indicates 26-42 days post-vaccination bleed. • Booster response: If pre-vaccination level â‰¤0.10 IU/mL, 4-fold increase and post-vaccination level â‰¥0.10 IU/mL. If pre-vaccination level >0.10 IU/mL and â‰¤2.7 IU/mL, 4-fold increase. If pre-vaccination level >2.7 IU/mL, 2-fold increase. • TENIVAC vaccine non-inferior to DECAVAC vaccine [upper limit of 95% CI for difference (DECAVAC vaccine minus TENIVAC vaccine) <5%]. • Non-inferiority criteria not prospectively specified for this endpoint. • TENIVAC vaccine non-inferior to DECAVAC vaccine [upper limit of 95% CI for difference (DECAVAC vaccine minus TENIVAC vaccine) <10%]. • Booster response: If pre-vaccination level â‰¤0.10 IU/mL, 4-fold increase and post-vaccination level â‰¥0.10 IU/mL. If pre-vaccination level >0.10 IU/mL and â‰¤2.56 IU/mL, 4-fold increase. If pre-vaccination level >2.56 IU/mL, 2-fold increase. • CDC. Diphtheria, tetanus and pertussis: recommendations for vaccine use and other preventive measures. Recommendations of the Immunization Practices Advisory Committee (ACIP). MMWR 1991;40(RR-10):1-28. • Stratton KR, et al, editors. Adverse events associated with childhood vaccines; evidence bearing on causality. Washington, DC: National Academy Press 1994. p. 67-117. • Mueller JH, Miller PA. Variable factors influencing the production of tetanus toxin. J Bacteriol 1954;67(3):271-7. • Stainer DW. Production of diphtheria toxin. In: Manclark CR, editor. Proceedings of an informal consultation on the World Health Organization requirements for diphtheria, tetanus, pertussis and combined vaccines. United States Public Health Services, Bethesda, MD. DHHS 91-1174. 1991. p. 7-11. • FDA. Department of Health and Human Services (DHHS). Biological products; bacterial vaccines and toxoids; implementation of efficacy review; proposed rule. Fed Reg 1985;50(240):51002-117. • Wassilak SGF, et al. Tetanus toxoid. In: Plotkin SA, Orenstein WA, Offit PA, editors. Vaccines. 5th ed. Philadelphia, PA: WB Saunders Company; 2008. p. 805-39. • Vitek CR and Wharton M. Diphtheria toxoid. In: Plotkin SA, Orenstein WA, Offit PA, editors. Vaccines. 5th ed. Philadelphia, PA: W.B. Saunders Company; 2008. p. 139-56. Vial, 1 dose - NDC No. 49281-215-58; in package of 10 vials, NDC No. 49281-215-10. Contains no latex. Syringe, 1 doseâ€“ NDC No. 49281-215-88; in package of 10 syringes, NDC No. 49281-215-15. The tip caps of the prefilled syringes may contain natural rubber latex. No other components contain latex. TENIVAC vaccine should be stored at 2° to 8°C (35° to 46°F). DO NOT FREEZE. Product which has been exposed to freezing should not be used. Do not use after expiration date shown on the label. Before administration of TENIVAC vaccine health-care providers should inform the patient, parent or guardian of the benefits and risks of the vaccine and the importance of completing the primary immunization series or receiving recommended booster doses, as appropriate, unless a contraindication to further immunization exists. The health-care provider should inform the patient, parent or guardian about the potential for adverse reactions that have been temporally associated with TENIVAC vaccine or other vaccines containing similar components. The health-care provider should provide the Vaccine Information Statements (VISs) which are required by the National Childhood Vaccine Injury Act of 1986 to be given with each immunization. Patients, parents, or guardians should be instructed to report adverse reactions to their health-care provider. Product information as of April 2013. TENIVAC® is a registered trademark of the sanofi pasteur group and its subsidiaries.